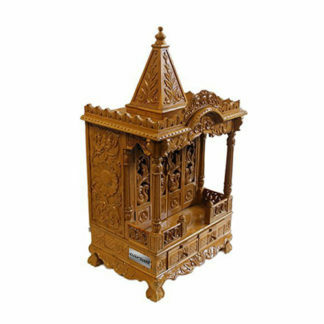 Traditional Wooden temple is made on the design inspired by actual pooja mandir. Designer Mandir shows a dome with a peacock design on the top.The top boundary is decorated with leaves carving. There is a broad engraved design below .There are two lavishly carved pillars. Elephants in sitting position are carved-out at the bottom of the pillars in front. It has a unique cut design which extends from one pillar to another at the back. There is a slider tray (pull out design) with a sleek design.It can be used to place Prasad or as incense stick holder stand.There is a three spacious decorated drawer beneath the slider tray that can be used for storing books or other pooja items. There is a flat base that supports the whole structure of the Wooden temple.